Symbols graphically describe, categorize, or rank geographic features, labels, and annotation in a map to locate and show qualitative and quantitative relationships. Symbols are one of four types—marker, line, fill, or text—depending on the type geometry they draw. They are generally applied to groups of features at the layer level, but graphics and text in a layout are also drawn using symbols. Symbols can be created and applied directly to features and graphics, and they can be optionally stored, managed, and shared in collections called styles. Symbols categorize and draw features in a layer. The easiest way to apply symbols to features and graphics is to choose from one of the thousands stored in the styles provided with ArcGIS. You can search for appropriate symbols by name or a keyword or simply browse through a visual palette to find what you need. You can apply symbols directly as they are or modify them first. Modified symbols can be saved in a style for later reuse. Symbols are often built using more than one component or color. Each component is stored in a separate layer within the symbol. An example is a cased line to represent a road, where one symbol layer is the fill and the other is the casing of the road. You can manage the way that multiple-layered symbols are drawn together—for example, all casings drawn before fills—with symbol level drawing. If the ideal symbol is not available in a style, you may wish to create a new one. You create a new symbol by modifying an existing symbol—even radically if necessary. A wide variety of appearances can be achieved by adjusting multitudes of symbols properties. When you create new symbols from the Symbol Selector dialog box, you can apply them directly to the current layer or graphic and optionally save them into a style. When you create new symbols in the Style Manager dialog box, you choose or create the style that will store the symbols first. Styles are containers for reusable things that appear on maps; they are a place to store, organize, and share symbols and other map components. Styles can promote standardization across related map products or across organizations by ensuring consistency. You can make your own styles with as much or as little content as you desire. You can create symbols and map elements from scratch or use existing ones as a starting point for modifications. ArcGIS provides a number of styles that can be used to meet a certain specification or achieve a certain look for your maps. The contents of a style are contained in individual folders within each style. 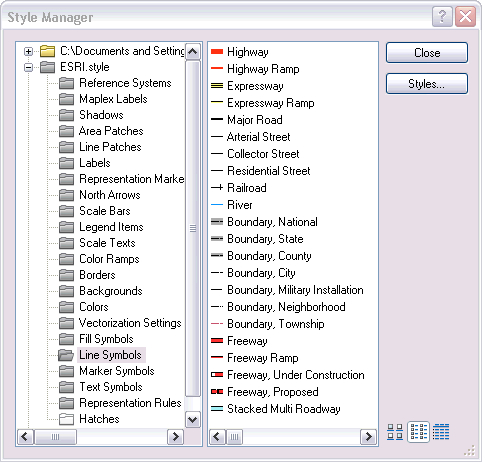 In the Style Manager dialog box, you interact with a style in ArcMap as a series of folders that contain different map elements, but a style is actually a single file (with a .style extension) that can be accessed from your computer's file system and shared with others. Styles are not dependent on the current map document; items you save into them will still be accessible when you open a different map document. Also, there is no reference maintained back to the style once a symbol is applied. When you select and apply a symbol from the Symbol Selector dialog box, a copy of the symbol is embedded within the layer or map document. Subsequent changes that you make to that symbol in your map are not reflected in the copy that is stored in the style. Similarly, if you later modify the symbol in the style, the change will not be propagated to the symbol embedded in your map. This means that you don't need access to the original styles to open and draw a map again. 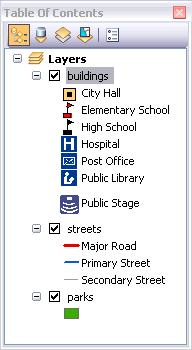 As you work in ArcMap authoring your maps, you may wish to reference certain styles that you will access often. The contents of referenced styles appear in the Symbol Selector dialog boxes for easy access. You can always search for other symbols even if they are in styles that are not referenced, though. If you have a few styles that you access often, you may want to make these part of your default set so that they are automatically referenced each time you open a new map document.